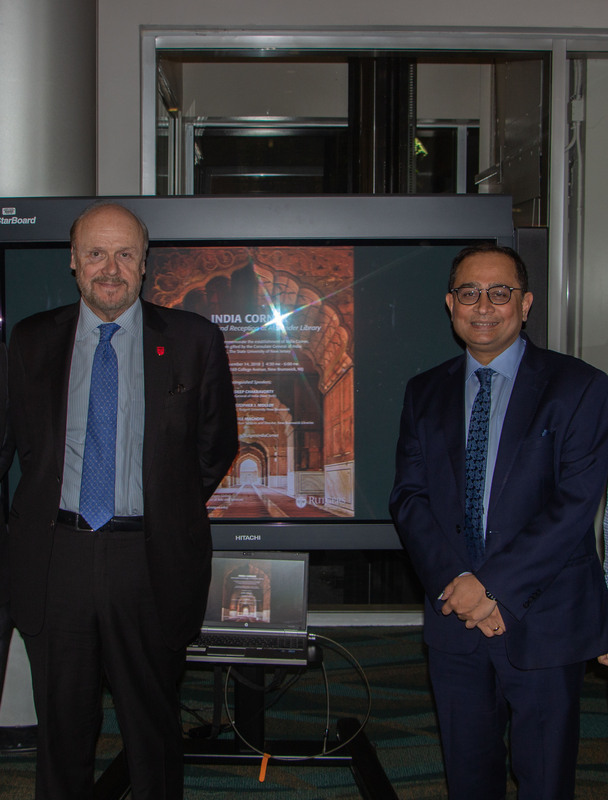 On Wednesday, November 14, 2018, Mr. Sandeep Chakravorty, Consul General of India (New York), and Mr. Shatrughna Sinha, Deputy Consul General of India (New York), visited Rutgers University to celebrate the dedication of “India Corner” at the Archibald S. Alexander Library. The “India Corner” is a book collection donated by the Consulate General of India to Rutgers University Libraries–New Brunswick. The titles in the collection—from Gandhi’s autobiography to Durga Das Basu’s commentary on the Constitution of India; from Sufi lyrics to Santal folk tales—represent India’s rich history and culture, and cover the country’s linguistic and geographical diversity. 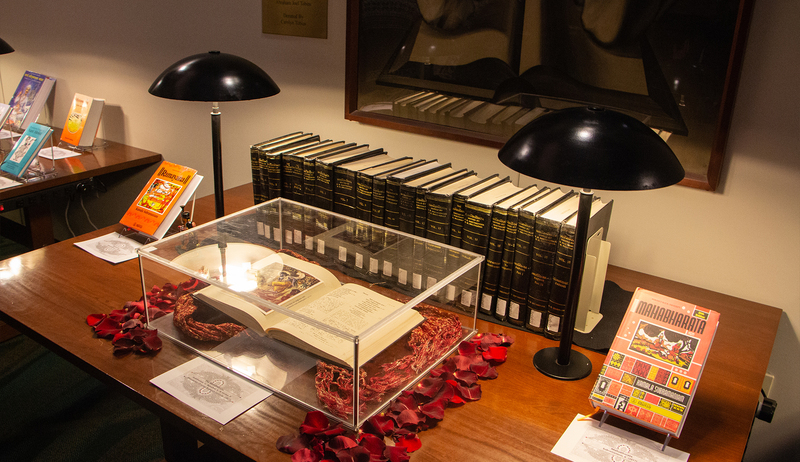 Rutgers is the fourth U.S. university to be gifted such a book collection; the University of Buffalo, the University of Pittsburgh, and Syracuse University each have their own “India Corner” at their libraries. 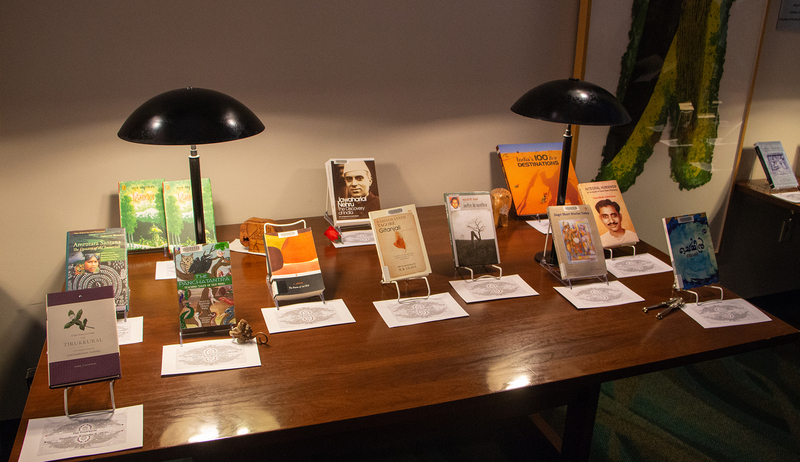 The “India Corner” book exhibit also included a selection of publications by Rutgers’ own faculty curated by the South Asia Librarian Triveni Kuchi. The “India Corner” book collection will be a valuable resource to Rutgers faculty and students who are interested in learning more about the history, literature, and philosophical traditions of India. Rutgers is home to more than 650 undergraduate and graduate students from India, as well as over 75 faculty and thousands of students of Indian origin. There are more than 70 courses taught at Rutgers with a direct focus on South Asia; this semester, 22 courses are being offered on topics ranging from Bollywood to Hindu philosophy to Sanskrit. 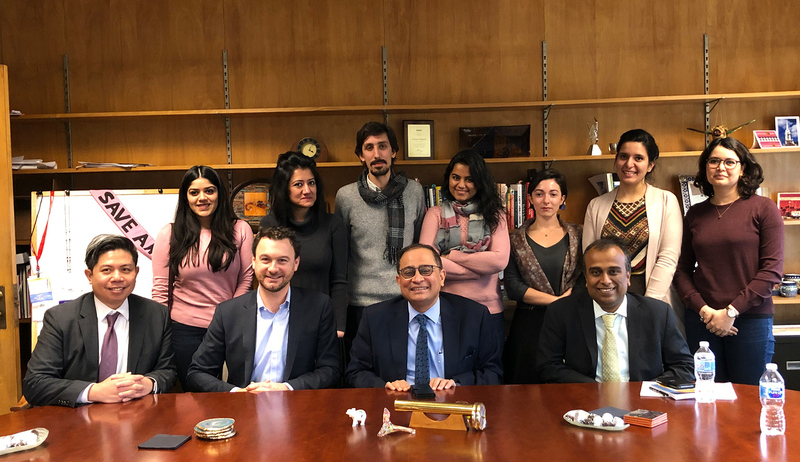 During their visit, Chakravorty and Shatrughna met with graduate students from various doctoral programs who are conducting research in South Asian Studies. They also met with a number of Rutgers leaders, including Christopher Molloy, Interim Chancellor of Rutgers University–New Brunswick; Eric Garfunkel, Vice President for Global Affairs; Dee Magnoni, Assistant Vice President for Information Services and Director of the New Brunswick Libraries; Jim Masschaele, Executive Vice Dean of the School of Arts and Sciences; Vonu Thakuria, Dean, Edward J. Bloustein School of Planning and Public Policy; Ingrid Fulmer, Associate Dean for Academic Affairs, School of Management and Labor Relations; Asher Ghertner, Director of the South Asian Studies Program; and Rick Lee, Director of Global Programs and Partnerships at Rutgers Global. Rutgers is committed to promoting research and other initiatives that advance the university’s relationship with India and Indian institutions. In 2012, Rutgers was one of four U.S. institutions to receive a grant of approximately $250,000 from President Barack Obama and Prime Minister Manmohan Singh as part of the Obama-Singh 21st Century Knowledge Initiative (OSKI). Rutgers has also partnered with the Indian Council for Cultural Relations (ICCR) to fund a Chair of Contemporary Indian Studies at the university. Several Rutgers units have active partnership agreements with higher education institutions in India, including Amity University Gurgaon and Era University (Rutgers Biomedical and Health Sciences); Assam Agricultural University (School of Environmental and Biological Sciences); King George’s Medical University (Rutgers Robert Wood Johnson Medical School); and Sibar Institute of Dental Sciences (Rutgers School of Dental Medicine).